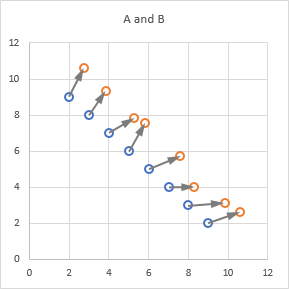 If you have XY data from two different times, or under two different sets of conditions, you can connect points of one series (one time or condition) to another (another time or condition), to help show how the data evolves. 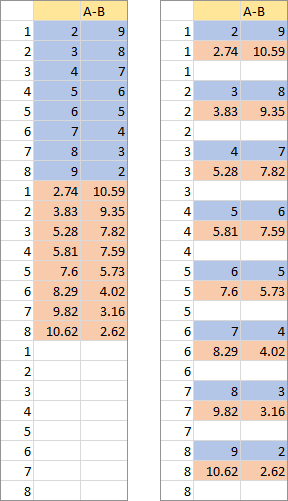 For example, here are two series of data that I might want to connect together. Several years ago I wrote Connect Two XY Series, which showed how to connect the points of one series to the corresponding points of another series. This approach used a third series with data from Series A and Series B, interwoven with blank cells. I followed this up with Connect Two XY Series with Arrows (VBA), which showed how to connect the two series with arrows. In Excel 2003 and earlier, you had to use VBA to draw the arrows, and this article provided the VBA (and it’s reproduced below). … the arrows no longer match up to the points. You could always delete the misaligned arrows and rerun the VBA procedure, but what a pain. 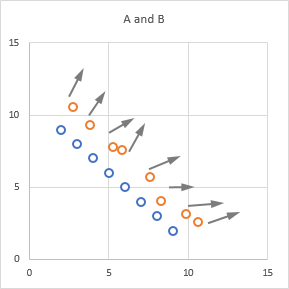 I hinted in this second article that you could connect the points with arrows in Excel 2007, without using VBA but instead by formatting the third series that connected the first two series. But I never explained how. This article fills the gap. You need to keep the original Series A and B data in place, so you can still easily plot the original points. You need to get data into a new range, interweaving Series A with Series B. 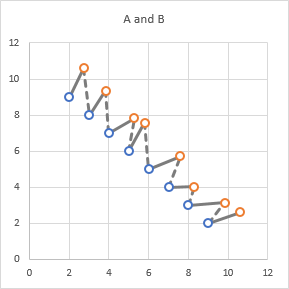 To get the data into this alternating arrangement, start by pasting the data from Series A into a new range, then paste the data from Series B below it. 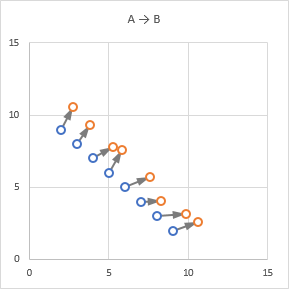 Enter a set of index numbers into a column adjacent to this combined data, from 1 to the number of points in Series A, and from 1 to the number of points in Series B (which should be the same number of points). This is the first data block below. Select the data, and sort by the column of digits you just entered. 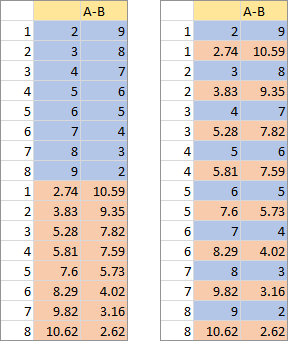 The data now has alternating Series A and B data (below right). Select the data and create a chart, or add it as a new series to the chart of Series A and Series B.
Hmmm, that’s almost what I want. But there are too many line segments. We need to eliminate half of them, shown as dashed lines below. We could format alternating line segments to be drawn with no line, but that’s mighty tedious after the first or second segment. Speaking from experience, because I had to format the dashed lines in the chart above, segment by segment. As I’ve written about in Mind the Gap – Charting Empty Cells, the way we get a gap between points in a chart is to have a gap in the data, that is, blank cells between the points. 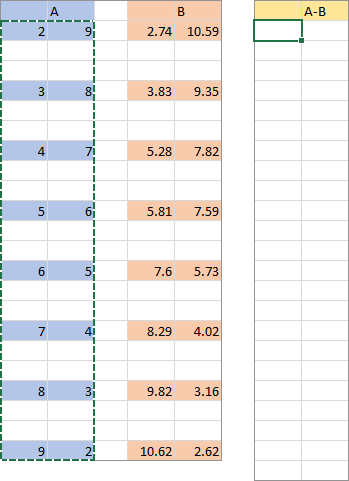 So let’s alter our protocol above, so that we start with the Series A data, then the Series B data below that, then an equal number of blank rows at the bottom, and include our index column (below left). Sort by the index column, to get Series A and B data pairs, separated by blanks (below right). 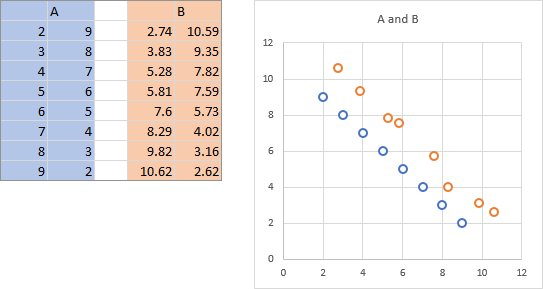 Now when we plot this data, we connect appropriate pairs of points, with gaps between points we do not want to connect. Above we produced our data range by copying the data into a new range, and sorting the data appropriately. We could instead have stretched out the data first, then copied and pasted using the Skip Blanks option. 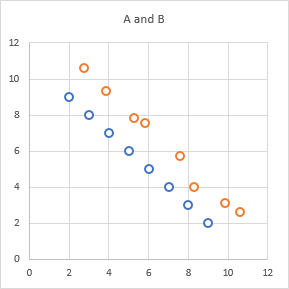 Here’s a copy of the Series A and B data, with two rows inserted between each point. … and use Paste Special, and check the Skip Blanks option near the bottom of the dialog. Skip Blanks prevents blanks in the copied range from being pasted over data in the target range, so the Series A data is preserved. Now the data is ready to plot. 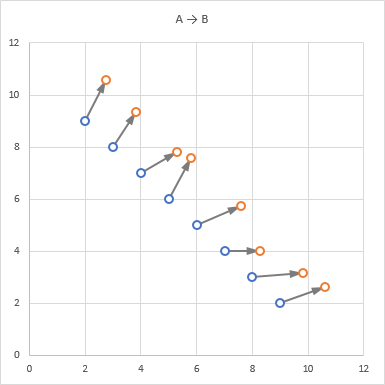 Select the Series A data (shaded blue below), and create an XY Scatter chart. 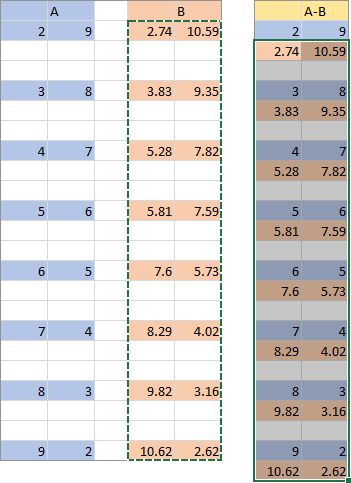 Then copy the Series B data (shaded orange), select the chart, and use Paste Special to add the data as a new series, with series in columns, Y values in the first column, series names in the first row. The resulting chart is shown below right. Now you need to format the line segments of the new series. Select the series and press Ctrl+1 (numeral one) to open the Format Data Series task pane or dialog. Click the End Arrow Type dropdown, and select the desired arrow type. The options include three arrowheads, a circle, a diamond, and a plain line. Now click the End Arrow Size dropdown, and choose an appropriate size for the arrowhead. There are combinations of three arrowhead lengths and widths. Now the line segments have been transformed into arrows. … the arrows still match up to the points. 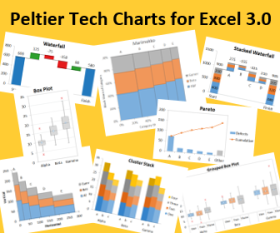 You don’t need to use VBA to connect points with arrows, but it is a good sample application of VBA to your charts. 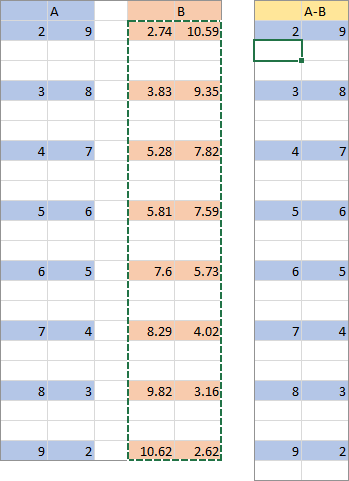 Just so you don’t have to go back to the earlier post, here is the VBA Procedure that connects the points with line segments with arrowheads. Posted: Tuesday, January 24th, 2017 under Formatting. The following offers a fairly minimal volume VBA to insert ‘proper’ blanks into a dataset. It can either be event-driven or rely on the user clicking a button to refresh the data. Re your first comment, unfortunately this approach is going to be as difficult to implement and maintain as a separate range containing the points for A and B mixed with blanks, and it is not going to allow one-ended arrows or different line colors for the connectors than for the series lines themselves. Re your second, maybe some characters didn’t come through properly, but I don’t understand what it is supposed to do. I apologise for leaving cryptic messages on your blog. I am always uncertain whether such contributions add value or merely distract the reader from the original post. 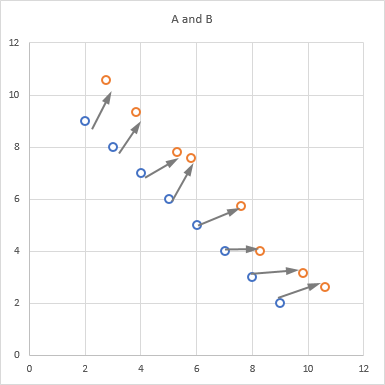 As you say the first approach cannot give a single-ended arrow since the excursion from series A to B is a round trip. The link to the next pair is hidden by series A which can be chosen to match the plot background or contrast (any colour). There is complete freedom to choose series B line type. I am not relying on gaps in the link series so there are no major maintenance issues. I even produced a version that has no helper cells but performs the entire calculation using named array formulas in memory. By then though, VBA may be seen as the simpler option! 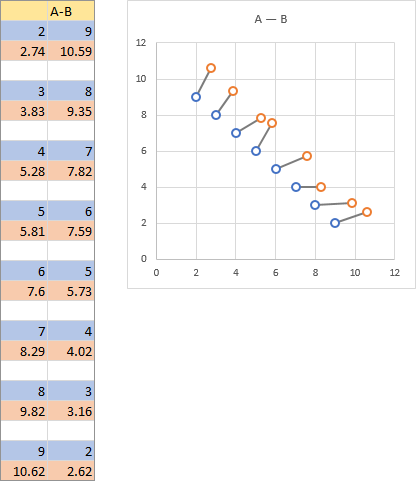 In the second example all I am doing is using VBA to copy the y-series to a new range for plotting. 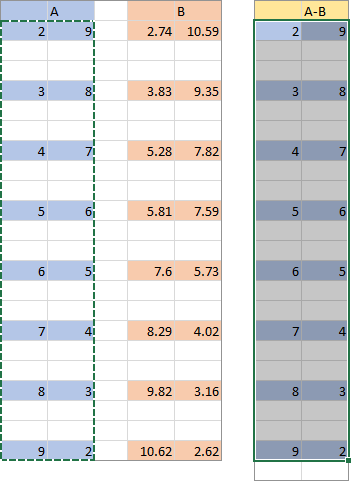 The copy has true blank cells rather than formulas that give “”. I monitor the two ranges and present the user with a command button when a refresh is required (i.e. the two ranges have different content). The problem with my post was that the ‘not equals to’ seems to be treated as a blank XML tag. Thanks for spotting that. That’s because I was editing the code in the blog post and not in the VB Editor.